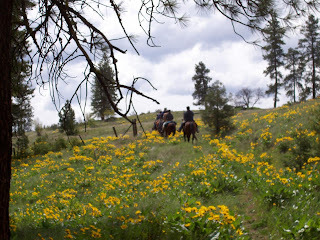 Methow Valley Back Country Horsemen (MVBCH) is one of 34 chapters belonging to the Back Country Horsemen of Washington (BCHW). MVBCH and BCHW are affiliated with Back Country Horsemen of America (BCHA) in 25 other states. If you ride on Washington's public trails, there is only one organization that supports your right to ride: The Back Country Horsemen of Washington. BCHW works with legislators, public land managers, private land owners, and anyone else who influences how your trails are used and maintained. Our "Leave No Trace" education program helps stock users understand how to use the environment responsibly, and safety programs to protect stock users and others who use the trails. Our 34 chapters across the state have regular meetings where we share equine health and training tips, schedule rides for enjoyment and education, and coordinate our efforts to keep those trails open. We socialize, but we are constantly working on keeping the trails open! MVBCH was involved with the Forest Service in developing the Twisp River Horse Camp 25 years ago. We have continued to upgrade and maintain it ever since then. 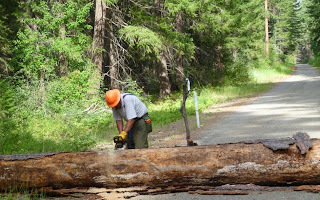 MVBCH Plans for 2015: MVBCH will once again spend $2,500 to augment Forest Service trail crews on a popular trail which needs more maintenance than the minimal removal of fallen trees. Work will be done to clear winter downfall from the trail head to the wilderness boundary on trails which will be worked on by Washington Trails Association (WTA) crews. 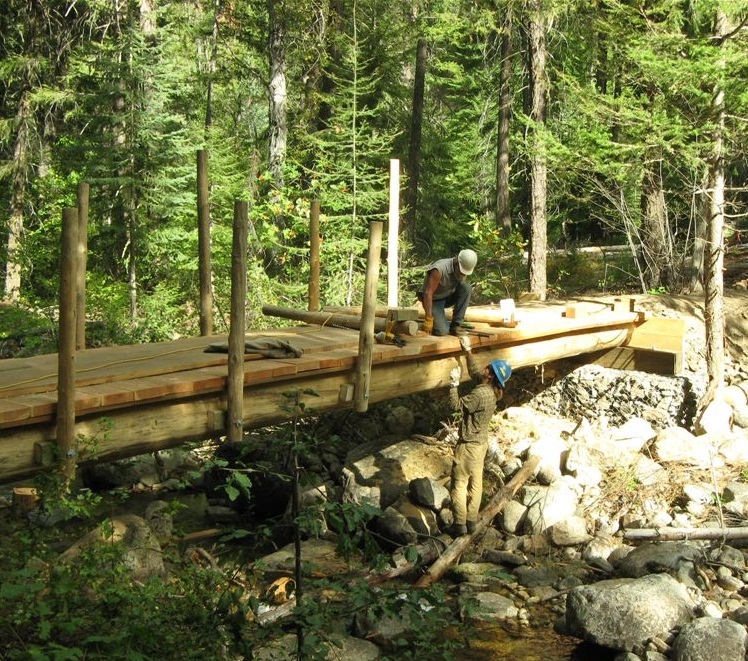 The Twisp River Trail will be worked on as required. 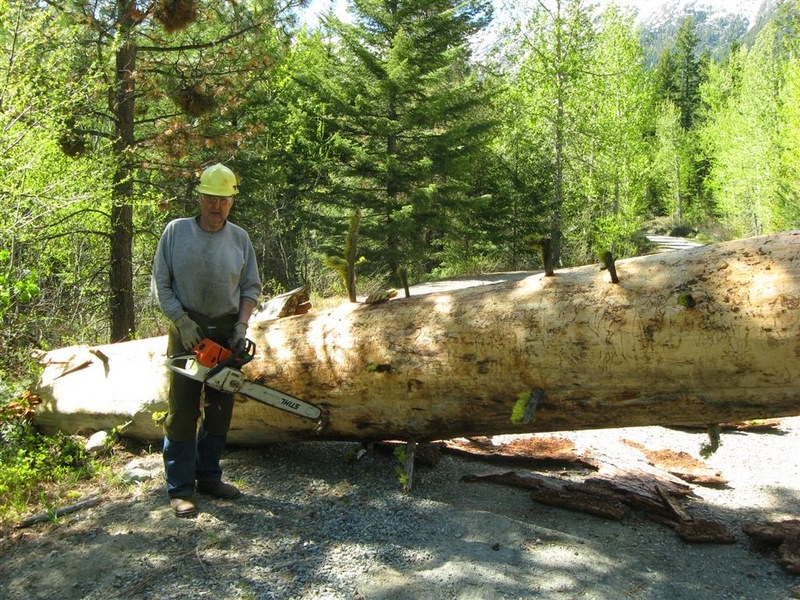 Several other trail projects, in conjunction with the Forest Service, are in the planning stages. 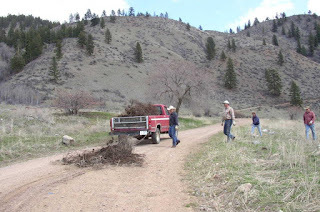 Other trail work (logging out, brushing, and tread work) will be done as required if volunteers are available. The Twisp River Horse Camp will be maintained, and planning continues for another camp at North Summit (Loup Loup). MVBCH in 2014: We spent $9,298 on trails and horse camp maintenance and development. 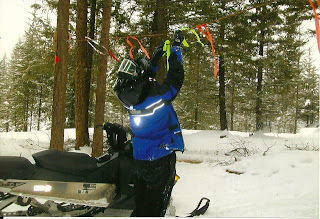 This included $2,500 on trails as a registered contractor with the US Forest Service. 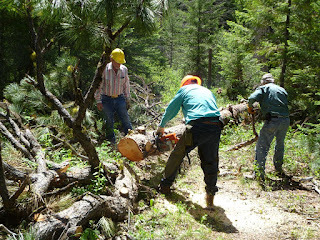 The money was used to augment the trail crew on War Creek Trail to maintain and brush the trail after routine clearance. Brushing takes patience and determination! 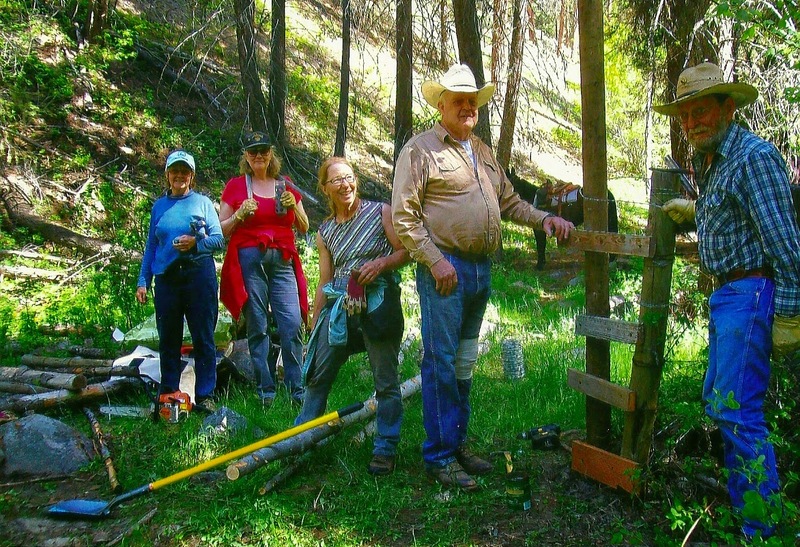 A total of 364 volunteer hours were spent on nine multi-user trails as well as on two horse camps. The Twisp River Trail, a 15-mile lowland trail popular with hikers, mountain bikers, and runners as well as equestrians, is 'adopted' by MVBCH. Members spent 158.5 hours logging out, brushing, and doing tread work on the trail in 2014. MVBCH in 2013: We spent $2,500 on trails as a registered contractor with the US Forest Service. The money was used to augment the trail crew on 3 specific trails so that hazardous growth of brush could be removed. Over $1300 was spent on horse camp maintenance and development. A total of 383 volunteer hours were spent on 8 multi-user trails and on the trail head/access road of another 2, as well as on 2 horse camps. 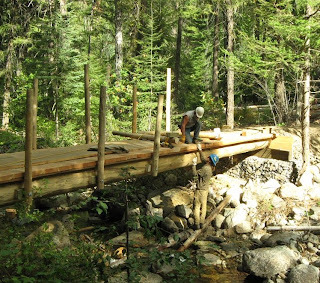 The Twisp River Trail, a 15-mile lowland trail popular with hikers, mountain bikers and runners as well as equestrians, is "adopted" by MVBCH. 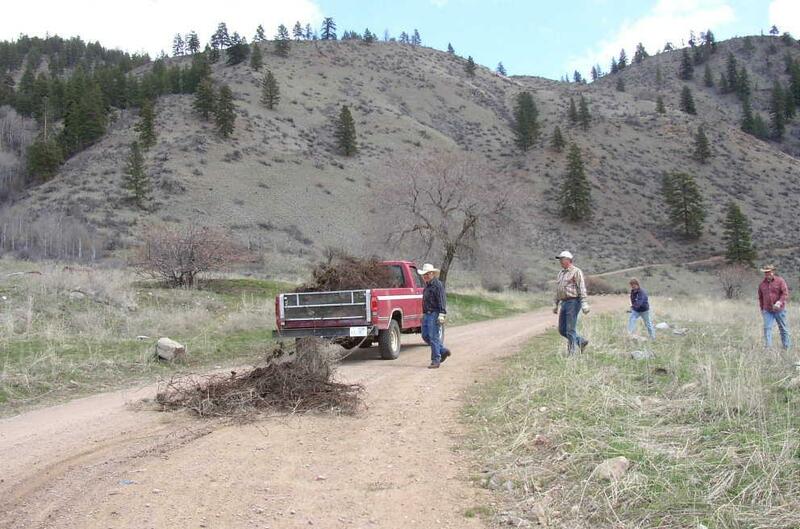 Members spent 176 hours logging out, brushing, and doing tread work on the trail. MVBCH in 2012: Members of the MVBCH spent 500 volunteer hours and $5,617 of our chapter funds on trails and horse camps, and cleared and maintained segments of six multi-user trails. At the Beaver Creek Horse Camp we installed 3 manure bunkers. 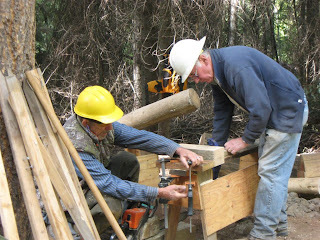 We cut and mounted posts and rails at the Pasaytan Drive Bridge; logged out the Little Bridge Creek Trail and the South Creek Trail; installed high lines, hauled manure, and provided general maintenance at the Twisp River Horse Camp; cut out a trail and built a drift gate at the Libby Lake Cuttoff Trail; and cleared brush from the West Fork of the Methow Trail. 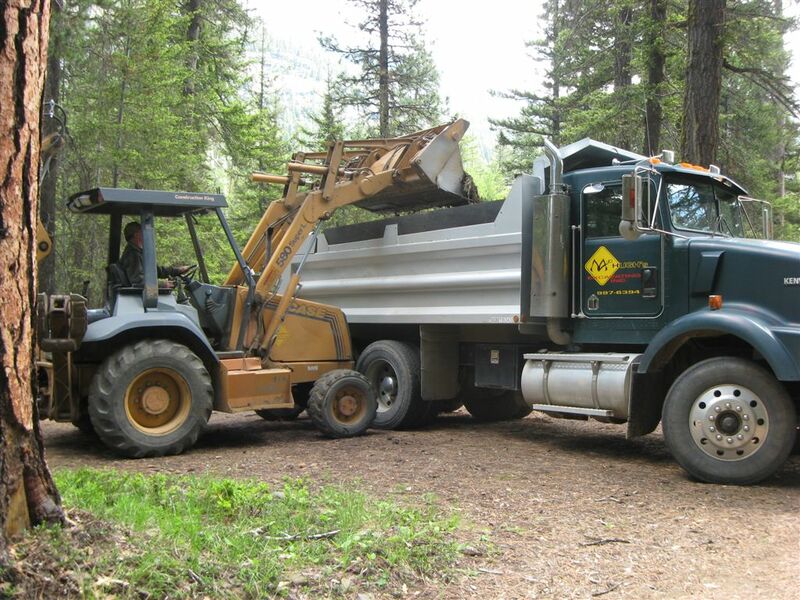 And, for the past few years we have been working with the Forestry Service to establish a new horse camp on the east side of the Methow Valley. This area near Loup Loup Pass would give access to many new trails, some of which are well suited to novice riders and/or horses. The Forest Service has obtained a Resource Advisory (RAC) grant to start developing the site and the MVBCH has pledged funding to support its construction. Our chapter has created a site plan for the new camp, spending $2,172 in 2012 for its development. In 2012 we installed temporary high lines. 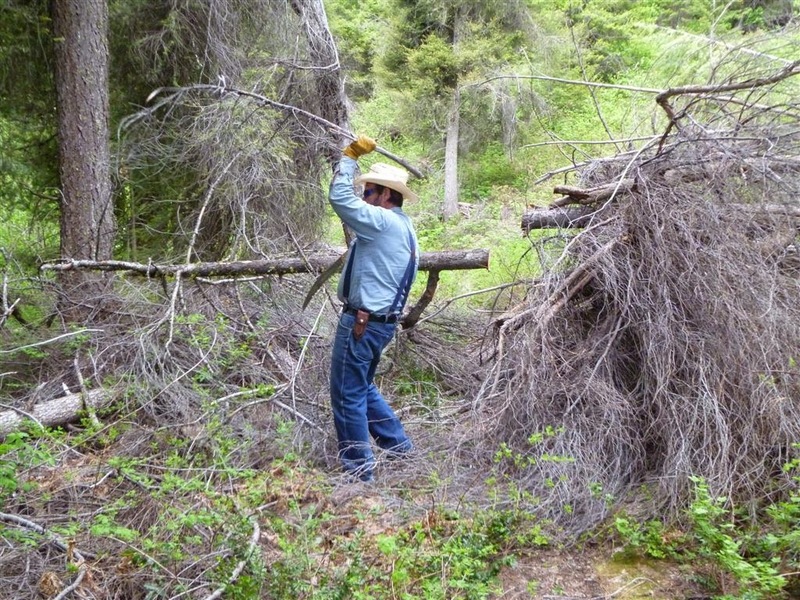 We clear debris to keep trails open for everyone. 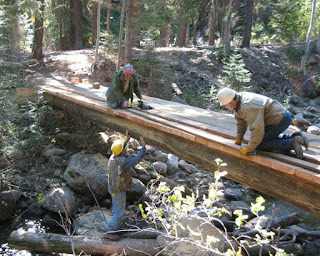 We build, repair, and maintain trail bridges. We provide inter-agency cooperation for work done. We add both skill and muscle to trail renovation projects! We work to upgrade or maintain campsites for horses. We mark highlines for snowmobile safety. We unblock roads to get to the trails. We clear our trails of barbed wire. Once we get to the trails, we enjoy them!